Clearly a labour of love with some strong and deep meanings in the songs. 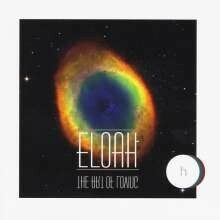 Eloah has a musical style which is bit prog rock-based, a bit new age and a bit folk in places. A very mysterious album in terms of packaging (the album title wording is a mirror image) and the first track title uses a letter system I am unfamiliar with. So, a very daunting start compounded by a very comprehensive CD booklet with all the very wordy lyrics and long list of musicians. The spoken vocals on the album are provided by Elmar Fuchs who on the first track follows the female sung main part with a half-second delay a bit like on David Bowie´s Ashes To Ashes. The song is fairly laid back punctuated by a rousing guitar solo by Orion Roos. By the time of the third track, ´Apostles, Traitors and Messiahs´, the listener will have decided whether they like this unusual vocal style or they not. Eloah is one of those groups where there is no middle ground, a very “Marmite” situation. There are some tracks on the album which are more commercial in nature, notably the bluesy ´Human Kind Of Blues´ which is quirky and catchy. This is another track with a great guitar break from Roos and one in which the spoken passages fit in and work well. The album has some excellent musicians on board – Dominik Mittergradnegger on sax and Johannes Boonstra on trombone add a nice feel to the tracks when they appear. Elmar Fuchs, omnipresent on spoken vocals, adds piano, guitar and flutes to the mix – a true multi-instrumentalist. In fairness, there are a lot of different musical styles employed in the recording of this album; for example ´A Holy Yes´ mixes African rhythms with some heavy duty guitar power chords. Then on the next track there is a mixture of opera and heavy metal guitar playing and so on.